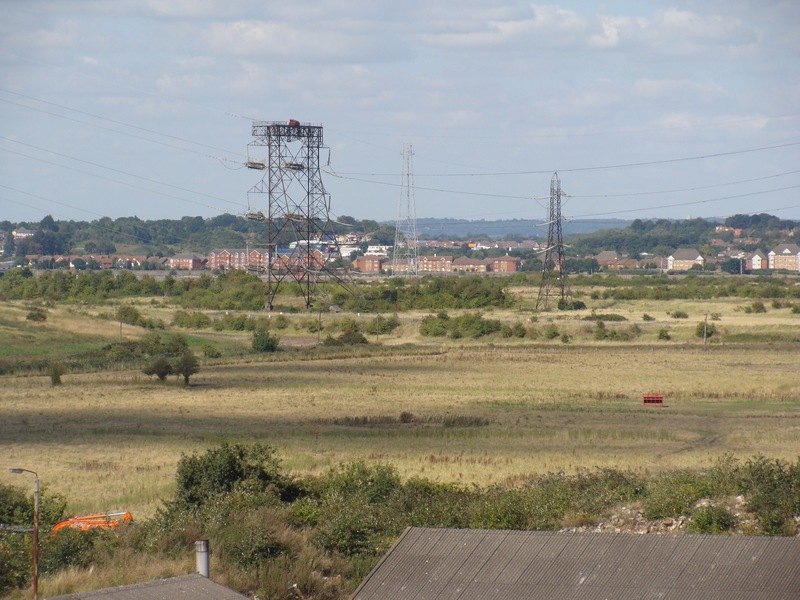 It is always interesting to retrace our footsteps through the past and the landscape of Swanscombe Marshes is one that offers many interesting detours. It was a lovely surprise recently to receive a series of notes taken on walks with the now-defunct North Kent Wildlife Preservation Society, describing the marshes in 1993. Reading through them there were references to structures long since gone and species that have also largely disappeared from the local area. But it was comforting to read too of the things that have stayed consistent, of waders probing the muddy foreshore, butterflies in flight over the grasslands and a kestrel holding the same pose, in the same place, that we can see today. Lets hope that continues. Here are some edited highlights – many thanks to Kevin Reynolds for these recollections. “On a cold, but sunny morning 14 members met at Swanscombe Marshes. Along Green Manor Way several Skylarks were seen in flight before we turned east to Northfleet, which turned out to be a blessing. Dunlin, Knot, Redshank and Oystercatcher were feeding on the mudflats; also seen were Great Black-back, Herring, Common and Black-headed Gulls plus 8 Cormorant roosting at Northfleet Point. “On a fine spring day eight members set off from Swanscombe. Passing the partially demolished Cement works, with the smoke stacks now gone, it was the end of the nesting sites on the chimneys for the Kestrel and Stock Dove. On Pilgrims Road, once the road to the ferry over to Essex, we paused briefly to survey the route of the proposed rail route across the marshes to under the Thames at Dartford. Arriving on Botany Marsh we saw a pair of Stonechat and a Small Tortoiseshell butterfly. Among the flora along Green Manor Way were Red Dead Nettle, Groundsel, Speedwell, and Colts foot growing in profusion throughout the walk. We reached the Thames at high water. The buildings on the jetty by now had all been demolished but we stopped for lunch overlooking the river where Cormorants could be seen on the buoys some with wings spread out drying out after a spot of fishing. After lunch we headed for Broadness Salt Marsh, alas not so salty these days, where we saw a flock of eleven Wheatears on a recently harrowed field, I had walked the marsh the previous day and none were to be seen so they must have arrived that day. “Great Lettuce and Duke of Argyle tea plant were seen on the approach to the marsh while butterflies seen on the day included Small White, Large White, Green Vein White Peacock, Red Admiral, Orange Tip and Holly Blue. 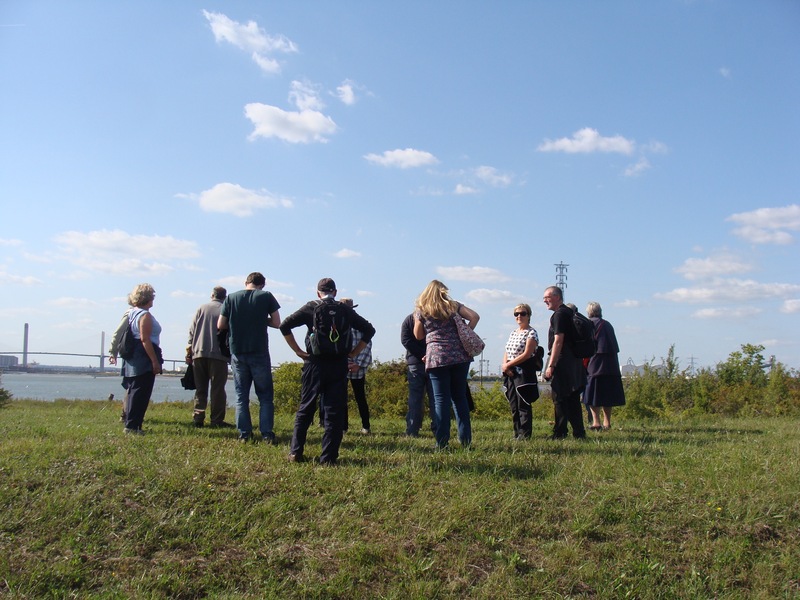 On Sunday 6th September 2015, Gravesend Historical Society led led by Christoph Bull, arranged a very enjoyable walk looking at the recent history of Swanscombe marshes. Meeting outside the George & Dragon pub on Galley Hill, the event was well attended with around 25 people present on a beautiful, sunny afternoon. Christoph started his introduction to this ancient part of Swanscombe’s landscape by highlighting its ‘peaceful and tranquil’ nature. The reason for this particular walk today he said, was due in part to the proposed plans by London Paramount preventing future access for people to the site if building goes ahead. Walking down narrow Pilgrims Road from Galley Hill, an ancient right of way to the marshes, we heard how this would once have been full of workers heading back and forth, day and night, to the factories once found in the vicinity. These included the New Northfleet Paper Mill (actually in Swanscombe) and White’s Cement Works which began in 1825. The paper mill was the scene of a major break through for published media in the latter 19th century with the advent of news print arising from a new sulphuric process occurring here. 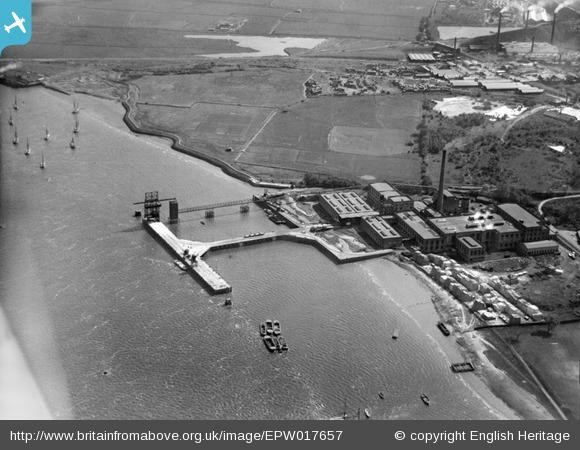 It was the cement factories though that had the biggest role to play in shaping modern Swanscombe. White’s cement factory grew to become one of the largest in the country, gradually expanding over much of the peninsula. Christoph told how a ‘cooperage’ was built on site – a place that manufactured the barrels in which to store the powder. Whilst it changed hands over a century and more, the factory remained – sometimes attracting complaints over its pollution. Another big event came in 1953 when Swanscombe peninsula flooded, along with many coastal areas in the South East. The sea wall embankment apparently pre-dates this event but was unable to hold the tide back. Another interesting story concerned an intrepid 18th century chronicler who described the ‘ague’ (fever) he met at Swanscombe. Apparently traditions of the time stated it was preferable for a farmer to wed a woman from the area due to her resistance to malaria that prospered aong the Thames marshes. Farmers on the Hoo Peninsula however used the opposite logic and went to Rochester for theirs – knowing that wives succumbing to ‘ague’ through poor resistance meant quicker inheritances! Nearby, at the junction of Manor Way, by the Ebbsfleet Utd stadium, we stood on parish borders where Christoph described the ‘battle of Northfleet’ which occurred by the ‘Stone Bridge’ over the River Fleet in c1610, during the Civil War. It was a fascinating end to an enjoyable walk back in time, across an ancient landscape. Thank you Christoph! Swanscombe marshes is a place steeped in human history and it’s easy to forget that in the dirty hands of developers, so keen to concrete over everything, we stand to lose our connections to this too. We enjoy learning the names of places particularly those that refer to natural features. Of course some change over time but their name’s can provide clues to their past use, their cultural value. At Swanscombe marshes one area in particular has fascinated us for some time – the area known as Black Duck Marsh (or Swanscombe Marsh). To our knowledge there are no records of vagrant Black ducks (a North American species) appearing in Greater London, the nearest accepted record was in Kent at Yantlet Creek in March 1967! So we delved deeper. That led us to an interesting website which outlines Swanscombe and Greenhithe’s prominent role in the local boat-building industry. 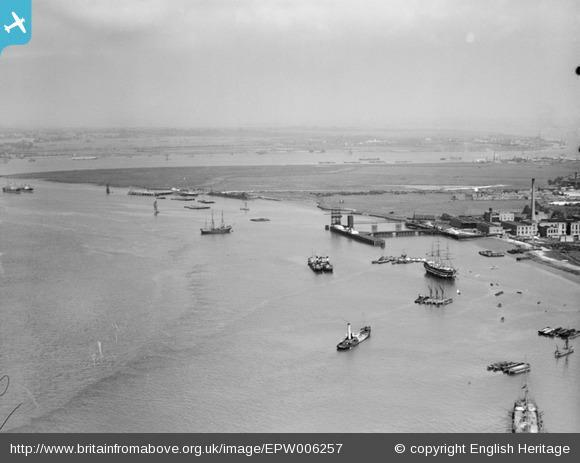 Thames Sailing Barges – Frank Willmott Archive, lists sailing barges built for John Bazley-White and Brothers, cement manufacturers who had factories at Swanscombe, Greenhithe and Gillingham among other locations. Looking through the list, it appears quite a few were made at Swanscombe and Greenhithe between 1874 and 1898. What’s more, many were named after birds that would have perhaps been familiar to locals and workers on the marshes: Plover, Dabchick, The Swan…and then Black Duck! Some sources suggest there was once a creek that went inland some way between the river and Lovers Lane. On that creek was a boat yard called Black Duck Boat Yard. Between the jetties it’s perhaps possible to trace the line of the old creek? Maybe one day we’ll get lucky enough to encounter a wild Black Duck at Swanscombe (! ), in the meantime, we’ll enjoy the vibrant marsh that shares its name. Over time we hope to add to this page, sharing the marshes’ history and stories. If you have any stories of Swanscombe’s past we’d love to hear them.